As you can tell by the title, this tutorial is going to be how to implement click tracking and display them on an overlay to your website. I recently launched a new website (CheckAttacks.com) and wanted to implement this to do further browsing habit analysis, for example if a user always clicks a certain link after a picture I could tailor that link to direct them better. The example to the left of here is what the finished result should look like. Click for a bigger picture. This article will be in 2 sections, section 1 is how to implement logging the clicks and section 2 will be how to implement the heatmap using the previous data. So without further ado. Ignore the canvas changes, that will be useful for later on! Config.php should contain the variables needed to access the database. And that should be all… click around your page and refresh the database to see it fill up with locations. That’s all well and good, but it would be better if we had a meaningful way to display this data. For this we will use a jQuery plugin called “High Performance JS heatmaps” a copy can be downloaded from the github repository. Once that is downloaded include it in the usual way. Now this may look confusing, but it’s actually quite simple. Firstly is sets starting variables. The function showcanvas(scale) is what the links reference, it just makes the canvas visible, sets the timescale and scrolls the page to the top. Then there is some more setting up after the windows.onload. The var update = function() is the main section of it. you will need to tailor the 3 variables size, intensity & decay to suit your own needs. The section inside if(visable2) is an ajax request similar to the previous one. Except this time it is POST’ing the timescale (daily, weekly etc.) 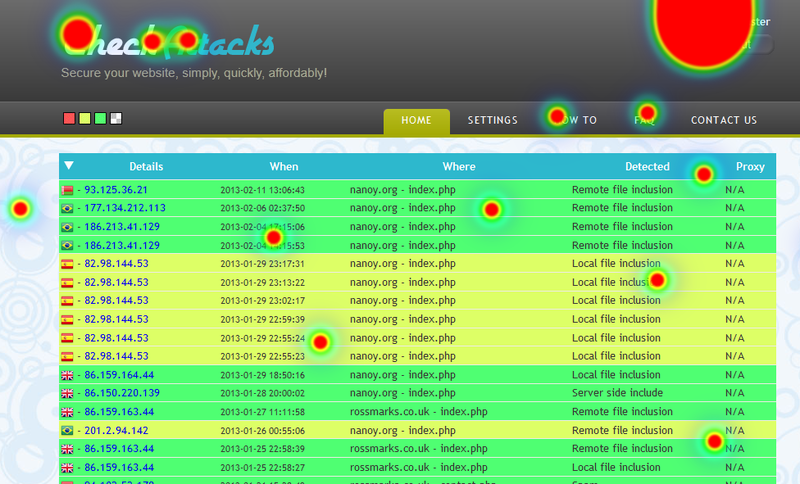 and the current page to heatmap.php. That’s it, you should have fully functioning click logging to a database, and heatmap display for various timescales. This script is also quick enough to display data in real-time… and the views are in fact updated so. As always, likes, comments & shares are always appreciated. I hope this article has helped you, if you have any improvements or suggestions I would love to hear them. This entry was posted in Tutorial, Web development by Ross Marks. Bookmark the permalink. I’ve tried to integrate this in my project but I recive a white page… the PHP part works well (recording clicks/generationg json response) But I can’t add the heatmap…. Do you got any advices for me please?